After releasing his book 'Life of Pies' it was inevitable that Martin Tarbuck would become a bit of a legend amongst the pie community. He has dedicated a large amount of his free time to travelling around Britain to review pies in the hope of finding where the best are available. The book covers a period of two years of pie eating and he estimates he ate over 400. The book reviews 314 of the most interesting ones. Martin has used a narrative to pull all 314 pie reviews together into a travelogue type affair. He did this after advice from his agent (he had originally planned a 'Good Pies Guide' reference type book). I would say this idea does work, as you don't have to read it all, you can just delve into it as you wish because he has an index of pies in each region. However, I thought that given our shared passion for pies that I really should read the whole book cover to cover. It is available to buy now on Amazon. 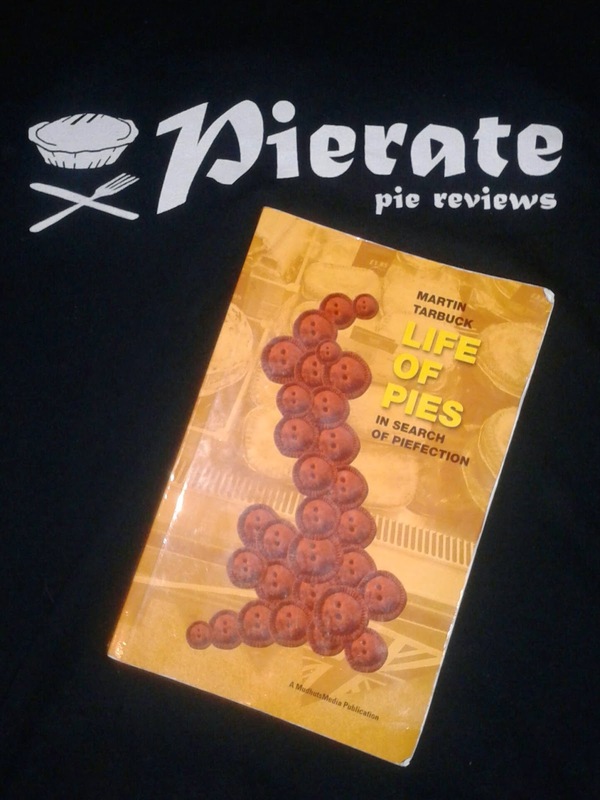 Life of Pies - as close as it comes to literature pie-fection! I can straight away say that this is an awesome reference and I thoroughly recommend it for anyone who is passionate about pies. I am sure I will use it in my future pie reviewing. Likewise I am pleased to see Martin used our recommendation of Paul's Pies (see page 276 of the book)! It is remarkable how similar Martin is to us, in that he travels around reviewing pies. Like us he does things in a fairly light-hearted way whilst still taking the pie quest pretty seriously. Unlike us, Martin is from Wigan and it is clear this has influenced his idea of the ultimate pie, which is different to our idea of the ultimate pie. What seems to float his boat is a Meat and Potato pie which can be brought hot straight from the shop. This has influenced his scoring criteria which scores how nice the 'Place' is that the pie was brought from. He does, like us, also stray into mass produced pies from the supermarket and inevitably it is difficult to compare this to the craft version in a bakery. But what is quite amazing is Martin has done hundreds of pie reviews despite doing it all on his own! It reminded me of 92 pies by Tom Dickinson which we also reviewed. It is difficult to string together repetitive events into one narrative and also to keep the events interesting. We know only too well it is difficult to not make a pie review boring after having written so many! From this perspective he does incredibly well and comes across as affable and self-depreciating. His sense of humour is always there which verges on bizarre. Sometimes I had no idea what he was on about but this was more than balanced out by the times where he genuinely made me laugh out loud. Comments like 'the gravy was so rich it has its own off-shore bank account' were brilliant. Be prepared for a relaxed attitude to what gets a review, he admits that they aren't pies, but pasties score pretty well. He even says that he is 'starting to miss pasties' at one point after eating only pies for a while (how could he...). Other local pastry delicacies also feature. I was pleased to learn all sorts of new pie terminology, such as growler, plate pie and stand pie. Apparently pork pies can be eaten hot, particularly in Yorkshire (I am now trying to get to grips with this idea, with little success). You will come to realise that Martin really hates to pay for parking (but also hates retail parks). The book makes it seem that you can't get a good hot pie in a bakery down South. Whilst I don't think this is completely true I did feel a bit of jealously as to the amount of great pie bakeries and butchers that Martin could find on his door step! There is a certainly a cultural difference in this regard. I really need to make more trips up North, especially to Barrow-in-Furness. I often ended up really wanting to eat a pie whilst reading this book! Even after the hundreds of pie reviews we've done over the past five years, it's quite incredible to see such a range of pies (and yes, a few other pastry products that sneaked in there!) being reviewed by one guy! It's a great credit to Martin that he has spent so much time, effort and money on producing a book that we would be proud of! The range of pies is quite amazing and, while some of the anecdotes and stories in the travel-log style do slightly go off on a tangent, the pies really do hold this book together. The list of recommendations will make any true pie fan's life a whole lot easier, and I for one will enjoy turning back to this book as a pie reference again and again. It's true what Pierateer SJL says that the style of the book is quite a unique but very entertaining look at the life of a pie eating road tripper - something perhaps only we Pierateers can really truly relate to on this scale - and there does appear to be a bit of a northern, Meat and Potato pie bias to the book, however Martin's effort put into this book will reward those who purchase it time and time again over the years. Martin - you're a pie rating legend! So how did Pierateer SJL rate the book? Condition - 6.0 out of 7 - The cover has a picture of the UK made of pies, shear genius. Colour - 5.0 out of 7 - The book has two sections of colour pictures to supplement the black and white pictures included throughout. It is enough to make you drool! Capacity - 5.5 out of 7 - 314 pie reviews packed into one book. Chewiness - 5.5 out of 7 - Plenty of pie statistics to chew on. Content - 5.5 out of 7 - Interesting throughout, perhaps felt a bit long at times but then there were 314 pies to cover. Consistency - 6.0 out of 7 - A consistent writing style and it worked well, certainly deserving of 'Pierate Recommended' status! Did I mention that it is for sale on Amazon??? Thank you so much for the great review. To get the seal of approval from the Pie Rate pie-fessionals is indeed a terrific accolade! 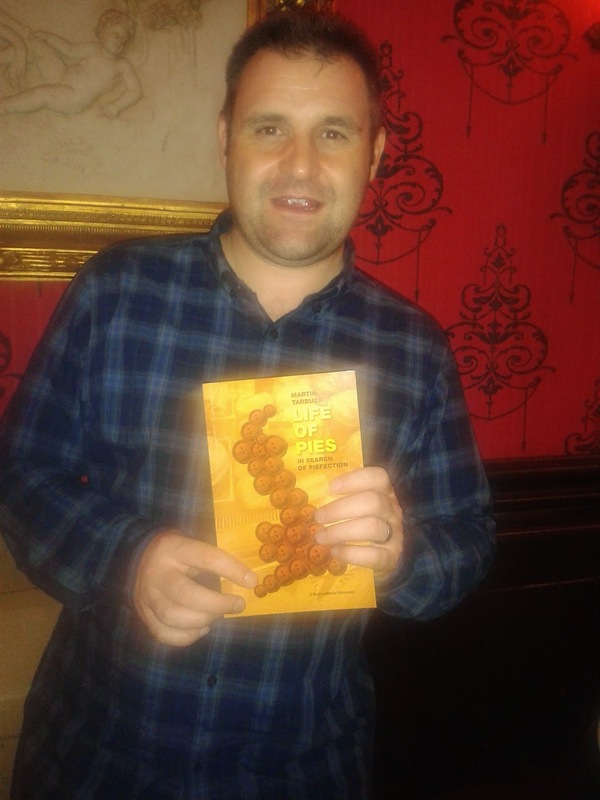 It was also a pleasure to meet Pierateer RAS at my book launch and who knows, with Wigan's current demise, we may meet up at a football game soon for some more pie reviewing!